As promised in a post last week, I picked up some sunchokes at the Full Circle Farm stand at the West Seattle Farmers Market Sunday. It follows in the heels of an event I attended where Andrew Stout from Full Circle joked that everyone in the room needed to develop five new recipes for sunchokes (no joke to this recipe developer!) I didn’t have quite the energy or time yesterday to tackle more than one to have with our little Sunday night supper. Chef Seth Caswell from Stumbling Goat had told me at that same event that he cooks sunchokes in many of the same ways he cooks potatoes. And he often finds himself reaching for the bottle of hazelnut oil as a complement to the tasty tubers. 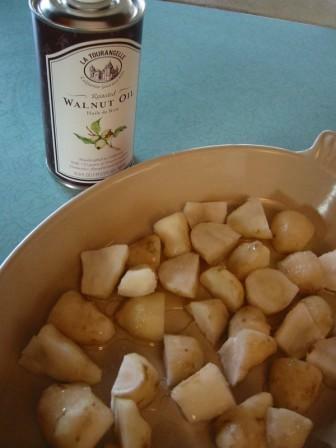 Sounded like a great idea to me, the rich nutty oil echoing the nuttiness of the sunchokes. I don’t happen to have hazelnut oil open right now, but (because I’m spoiled) I do have pistachio oil and walnut oil in the fridge. I got a slew of samples a few months ago from La Tourangelle, a partnership between one of France’s oldest artisan oil producers and a California oil manufacturer. Their line includes a dozen-plus oils, from avocado to pumpkin seed, a few of which are organic. If I had some pistachios on my shelf, I’d have used the pistachio oil yesterday. But I went with walnut instead. First I scraped the skin from the sunchokes using a small spoon; it’s a thin papery skin much like that of ginger root. I find a regular peeler is overkill. Be sure to have a bowl of cold water handy to drop the peeled chokes in; they brown quickly. With the oven preheated to 400 degrees, I drained and coarsely chopped the sunchokes. Tossed them in some walnut oil, a sprinkle of salt and pepper, into the oven for about 40 minutes. I tossed in toasted walnuts just before serving. 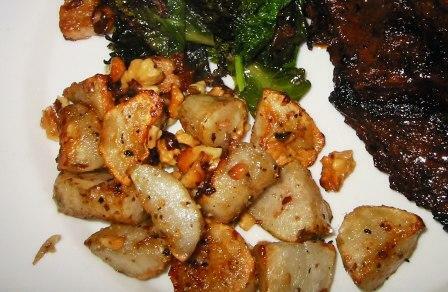 The roasted sunchokes were an ideal pairing for the skirt steak, which I marinated for a few hours in balsamic vinegar, minced garlic and olive oil. I’d picked up a bag of hearty greens at the market as well; the farmer pointed out that they were tender enough to eat raw as a salad, but I chose to lightly braise them instead. Another wonderful thing I happened to have in the fridge was some leftover pork belly from an amazing pasta dish at La Medusa on Friday night. I chopped that up, sliced some garlic and started by browning those two together in a skillet. Added a splash (maybe 1/2 cup) of good chicken broth, tossed in the greens and cooked until they were tender and most of the liquid had evaporated. This worked out to be quite a nice Sunday dinner. It’s gotten to be one of my favorite meals of the week thanks to my neighborhood farmers market.